Rusty Miller was born in California in 1943 and grew up surfing in Encinitas. This authentic surf icon set several competitive records and participated in the World Tour of Surfing, being a finalist for the Duke Kahanamoku Invitational twice. Rusty, was also one of the most prominent American big riders. He lived on the Hawaiian island of Kauai before moving to Sydney, Australia, a country where still resides. He sailed till Tahiti, New Zealand, Japan, Australia, Middle East and Mediterranean. Surftotal:You started to surf with 10 years old, in 1953. Who gave you a board and how did you begin? Rusty Miller: I grew up on the beaches in Southern California. My family lived next to the ocean and my sisters and I rode air mattresses and spent our summers on the beach. A childhood mate took me out one day at la Jolla Shores near San Diego, which was my first time. Later that year an older lifeguard named John Elwell encouraged and helped me, lending me his 10 ft Simmons surfboard. I then bought a used, water-soaked ten foot six inch balsa/redwood stringer board and stripped off the glass. From this board another one of the friendly lifeguards, Fred Ashley hand shaped me a 7’11” ‘Chip’ next to the lifeguard tower on a stand in the sand with a draw plane and Japanese block plane. Another surfer who influenced me a lot a little later was the greatest surfer of that era: Phil Edwards. What did it mean for you to be invited to the inaugural Duke Kahanamoku invitational? Rusty Miller: I was extremely honored to be invited to be in the first event in 1964 and the following three events. They were held in the name of the father of modern surfing and the Hawaiian Aloha spirit, The Duke. First of all it meant that among my peers I was considered to be respectably skilled in the riding of big waves. This was not taken for granted by me as it had taken some previous big winter wave seasons on the Hawaiian North Shore to prove my worth. It is still the same today currenly for the contemporary equivalent event: The Eddie. 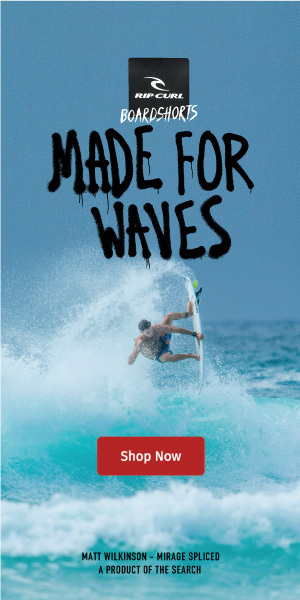 You introduced the original commercial wax for surfboards, Wax Mate, into the surfing world. Can you tell about this business experience? Rusty Miller: In the early ‘60s three friends and I started what we believe was the first surfboard accessories business. In those days surf shops mainly carried surfboards only. Our business was called Surf Research. The business included: specially formulated, scented purple, surf wax wrapped in cellophane with a clever label, Spraymate, a spray non-skid solution for decking of any ocean-going vehicle, Baggies, our nylon knit boardshorts, bikinis, a patch kit, surfboard racks, wetsuits, a breakfast cereal called New Food and a line of flexible lifesaving rescue tubes sold under our World Lifeguard Products label. Our wax was unusual for the time. There were two blends of wax bars produced: warm and cold. On the back of the paper labels we put one line expressions and wise sayings like: ‘concrete and steel will kill, country living is high living, make peace not war, freedom from desire leads to inward peace and got to get a horse and ride.’ These words were expressions of how we wanted the world to be. I was the salesman while Mike Doyle was the ideas man and Garth Murphy was the business head. We had the first answer machine as we always wanted to go surfing. So, we’d put the wax into their containers to cool, put the answer machine on and head off surfing for hours. It wasn’t that good for business. We sold the business in the late 1960s to, coincidentally, my childhood mate, John Baker, who I first surfed with. The business still operates to this day under the name Wax Research, which makes the brand Sticky Bumps. In 60´s you surfed big waves in Sunset, can you describe how was surfing big waves in that time? Rusty Miller: I did ride a nine six and ten foot surfboard there. When I lived on the island of Kauai where I moved to in the late 1960s I had several boards in the eight foot range. I rode at the beautiful point break of Hanalei. Four years ago when I was only 69 years old I visited Oahu and luckily got to surf a very high quality ten to twelve foot day at Sunset Beach with light off shore winds and only a dozen locals out surfing. I rode a brand new 9’9 Reno Abelllira ‘tiger tail’ that Reno let me choose out of the back of his truck. He had shaped its step tail design in respect to the late renowned surfer and activist John Kelly. You were one of the first surfers in Uluwatu Indonesia, can you describe a little bit of this adventure? Rusty Miller: Australians’ Albe Falzon and David Elfick were making the surfing film, Morning of the Earth, and asked myself and a 15 year old boy from Sydney, Steven Cooney to venture to Indonesia with them. We were the first ones to surf the now illustrious wave at Uluwatu just down from the sacred Balinese temple that sits atop the cliffs on the hot dry arid south west tip of the magic Hindu island. The year was 1971. Albe had originally scouted a trail over towards the cliff and sussed out the wave lines he heard roaring below. The locals had made a path to the beach through the back of the cave, which gave it an extra animated atmosphere. The reef fishermen had made a bamboo ladder that connected the ravine that water fell through into the back of the cave. The cave was an echo chamber and the rocks were a magic spectrum of colors and smell of organic material. The sea that day was teeming with wildlife in a wide variety of species. The tide was low when we got there and there was plenty of reef exposed. The surf itself was pumping left barrels in steady rhythm. We tip toed out over the unfamiliar reef as shown in the movie Morning of the Earth (I’m on the left side in the film logo) and launched at a 45 degree angle to take advantage of the sweep to get outside the break. The water was teeming with big shapes: dugongs, dolphins and swarms of fish. Gannets and other competing seabirds were diving everywhere and killer whales appeared outside. We caught some rides very carefully at first and then settled into hours of riding until it started to get dark. Looking back I am so grateful that the Bali spirits were so kind to us for we did not get injured and just seemed to flow with the day. That night we camped on a mound up against the cliff face and made a small fire to keep warm as the full moon rose. It was a bit scary because there are many stories about what historically happened on that part of the island. But that is another story. It is an honour to be the first to ride a place. It is a sacred surf memory that has blessed my surfing life.